Black 47 have been playing its big-band, Celtic rock sound for 20 years now. Never strict traditionalists, their best-known hit “Funky Ceili” in 1993 was a jam band rampage, and they’ve also dabbled in rap, reggae and blue-eyed soul. Still there’s always something Irish going on, whether it’s the tootle of pennywhistle, the jig of fiddle or the hard political protest embedded in their party-friendly songs. 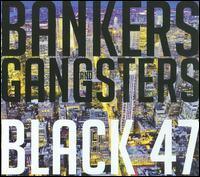 Bankers and Gangsters, out this month, continues the fight with swipes at mortgage lenders, college costs, corruption and incompetence. Fight the power or drink green beer—who ever said you had to choose? -J.K.
One time only on 03/14/2010. .